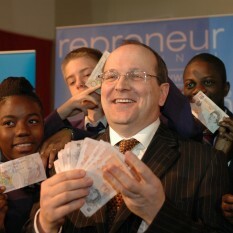 Earlier this year, Andrew Reynolds funded a brand new initiative the Make Your Mark with a Tenner campaign. 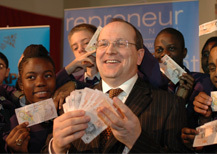 Mr Reynolds provided 10,000 tenners to thousands of young people across the UK who were given a month to generate as much profit and social impact as they could. The highest profit on £10 was £410 an impressive 4100% increase in a month. An average profit (among the top 50) of 99.33 a 993% increase. The biggest team profit was £1000, based on five students clubbing together. The resounding message from students and teachers alike is that everybody taking part had discovered something valuable about the world of enterprise. Delivering social purpose was a big theme. Half of the 50 winning entries either specifically designed their ideas to benefit others or donated their profits, aiding good causes both at home and abroad. 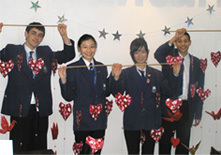 For example, the Cathay Craftz’ business from Manchester Academy used the profits from their origami company to sponsor five students through secondary education at a South African partner school. Yidan Liu, one of the company’s directors said: “Cathay Craftz was fun because it was dead exciting and it gave us a chance to work with real businesses. We got some profit for ourselves but we also got to help students at a South African school, who don’t get the same opportunities as we do at Manchester Academy”. A team from Holmer Green Senior school in High Wycombe ran a portfolio of money-making ideas including a treasure hunt and PS2 competition to raise £1,000 to rebuild a school in Kenya. Other social causes that benefited include MacMillan Cancer Research, Plan International, Mothers Against Guns and Great Ormond Street Hospital. The 50 whose ideas had the most social impact now have the opportunity to bid for 1,000 from the Big Boost fund, in order to develop their ideas further. Projects were enormously varied ranging from making everlasting flowers and stone masonry house numbers, to chocolate fountains and salsa lessons. Young people made cakes, ran football, basketball and craft coaching sessions, recorded original CDs – including one to address the negative perception of teens whilst some teams encouraged local businesses to match profits in order to send more money to good causes. The top 50 profit making entries and the 50 who were judged to have made the most social impact are being rewarded with a copy of Change the World for a Fiver and Richard Branson’s Screw It, Let’s Do It, to inspire them to continue turning their ideas into reality. The teachers on hand to ensure students made the most of this opportunity were also inspired by the range of ideas their students produced. Phil Waterhouse, a teacher at Balcarras School in Kings, Gloucester, commented: “Make Your Mark with a Tenner really encapsulates what I believe Enterprise Education to be about – it gave students the confidence and opportunity to try and set up a mini-business within the month. It provided all the students with the inspiration to get involved and try to make their mark and the overwhelming majority of the 120 students taking part did this very successfully”. A number of participants intend to continue their enterprises including Nicole Bothma from Lipson Community College. She is investing the profits from her nail and hairdressing business in driving lessons so she can take her new hairdressing business mobile.